Hey teacher friends! I don’t know about you, but I am always looking for fun, meaningful ways to engage my students during math (or anything, really). 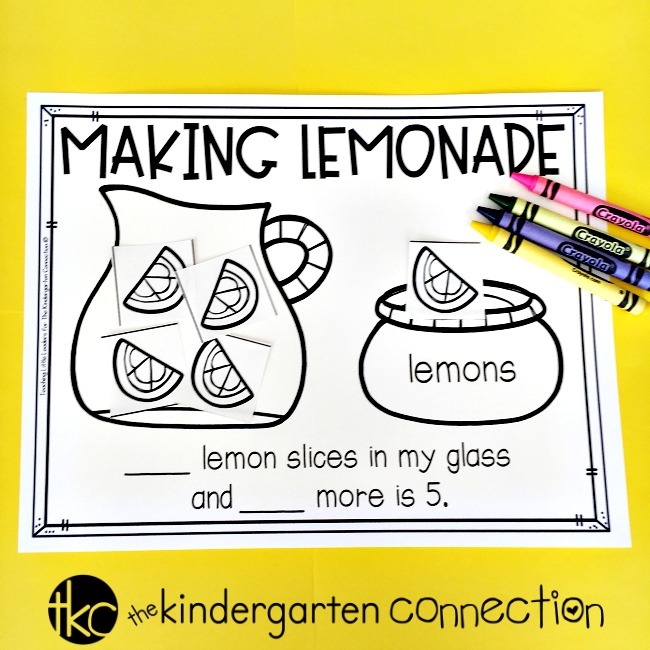 That’s why I made this lemonade-themed activity. It can be used multiple ways as you guide your students to build an understanding of part-part-whole relationships and decomposing numbers. Whether you want to spruce up your small group math lessons or are checking for student understanding, this activity has what you need! 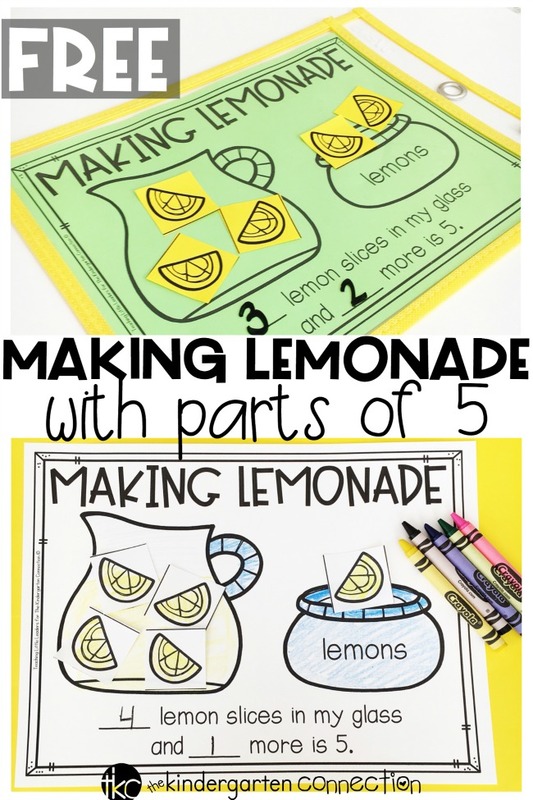 Print the “Making Lemonade” and lemon slice cut outs. I printed mine on neon Astrobrights paper to make it really pop. You can laminate the mat for durability, or keep it simple and place it inside a clear protective sheet. 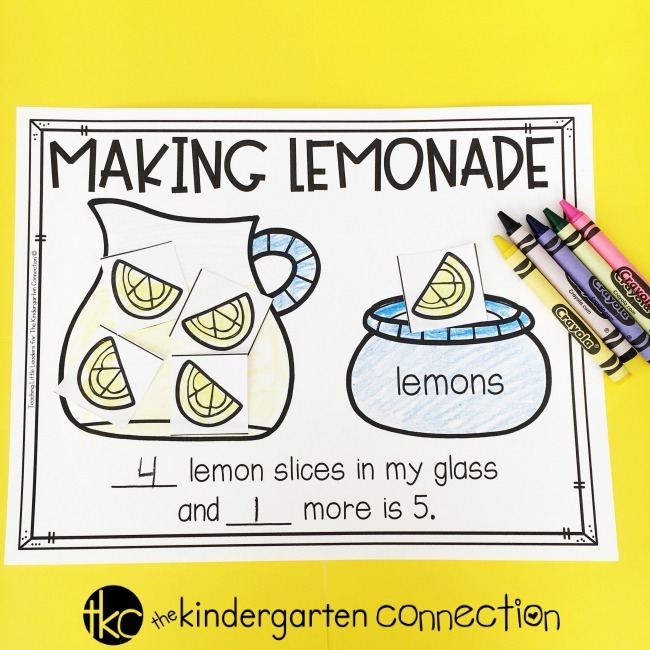 To use this decomposing numbers activity in your small group, give each student a “Making Lemonade” mat and 5 lemon slices (the paper cut outs, of course). The large lemon glass on the mat will be your students’ (pretend) lemonade glass. The picture of the jar labeled lemons represents the other part of the whole that students need to make 5. It’s important that if your students are just starting to explore parts of 5, that you guide them through making the various parts. To begin, have students count the number of lemon slices that they have. Let them know that they’re going to be exploring the different parts that make 5. Be sure to also read the sentence frame on the bottom of the mat with them. “Put __ lemons in your glass.” Students move given number of lemon slices into their lemonade glass. “Put the rest of the lemons in the lemon jar.” Students move remaining lemon slices onto the jar picture. “How many lemons are in your glass? How many more are in your lemon jar?” Students respond. “Let’s say the number sentence.” Students and teacher say the sentence at the bottom of the mat together, replacing the blanks with the numbers used. Once they have said the sentence, they can write the missing numbers and read it again. Teacher Tip: Check to see who can identify the groups without counting them. This shows a basic understanding of subitizing. Subitizing is an essential stage of number development that refers to being able to instantly recognize the number of objects in a set without having to count them. If you have a student who is not yet able to identify the amount without counting, they may not be ready to begin working on recognizing the parts that make a whole. 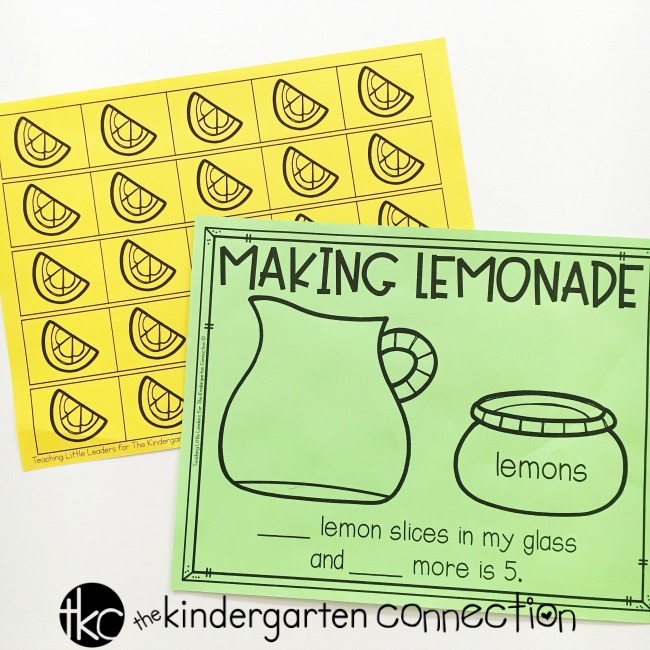 Print enough “Making Lemonade” mats and sets of 5 lemon slices for the students in your class on white copy paper. I suggest leaving the lemon slices in strips of 5 for your students to cut out. Yay for more fine motor practice! 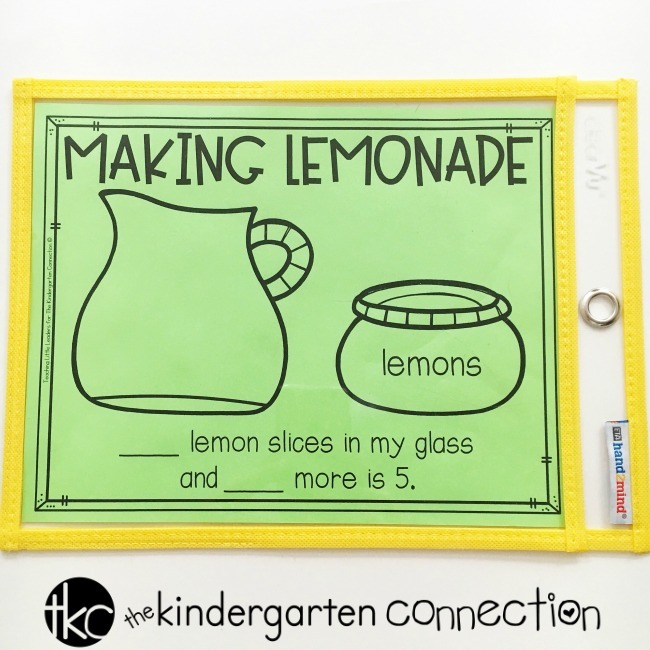 When introducing the activity, let your students know that the large glass on the mat is their lemonade glass and the jar picture has the extra lemons. Tell them that they’re going to use the glass and the jar to show the parts that make 5. Just as you would if you were using this for a small group activity, be sure to read the sentence frame with your students. 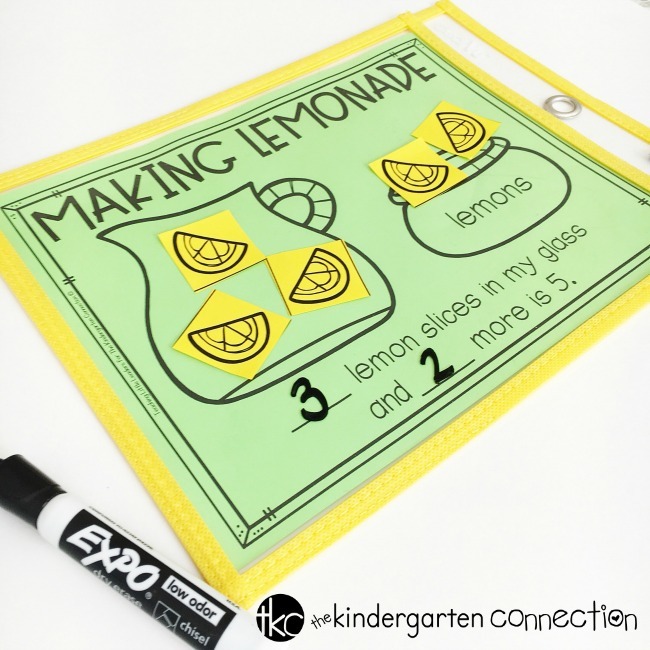 Hand out 1 “Making Lemonade” mat and 1 set of 5 lemon slices to each student. Once they cut out their lemon slices, you can encourage them to try setting up the lemon slices on the mat in different ways. Eventually, they should decide on how they’d like to separate the lemon slices to show the parts of 5 and glue them down. Once they have them separated, they can fill in the sentence frame on the bottom. The last step is to color, of course! I hope that you and your students get a lot out of this activity! You can download this free Decomposing Numbers Lemonade Activity by clicking the yellow button at the bottom of this post. 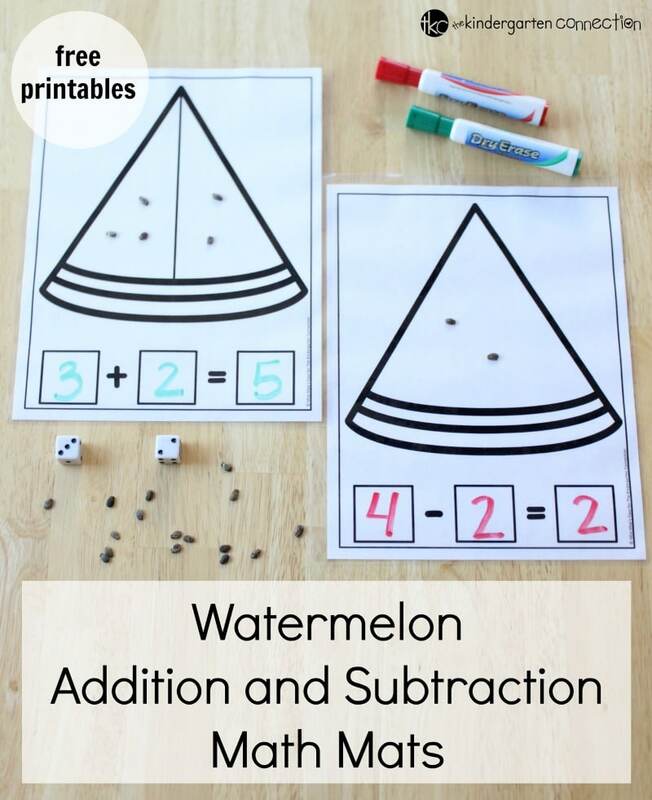 Then, hop over and grab our Watermelon Math Mats!